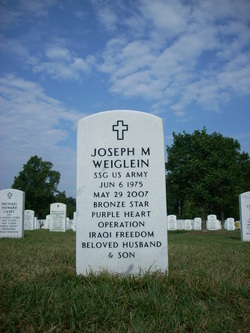 Hometown: Audubon, New Jersey, U.S.
Died: May 29, 2007 in Operation Iraqi Freedom. Unit: Army, 2nd Battalion, 14th Infantry Regiment, 2nd Brigade Combat Team, 10th Mountain Division (Light Infantry), Fort Drum, N.Y.
Staff Sgt. Weiglein of Audubon, NJ. had been in the Army for 12 years. He had moved around a lot, South Korea, Kansas, Kuwait, Tennessee and Georgia. His last assignment was as an infantry staff sergeant, based with the 10th Mountain Division at Fort Drum, N.Y. Before moving to Fort Drum, he was working as a recruiter, but he longed to return to the regular infantry. Before he was a sergeant in Iraq, he was a small town kid. He was a Boy Scout, a soccer player, and a fisherman. The Army gave Joe a sense of purpose. He was very proud of his mission. Joe made a special stop at Haviland Avenue Elementary where he went as a youngster before going back to Iraq. The students had adopted him and his unit. He patiently fielded questions from 256 curious young minds. As a die hard Eagles fan he attended the Eagles-Giants playoff game when he was last home in January. His military awards include the Purple Heart and the Army Commendation Medal with two oak leaf clusters. 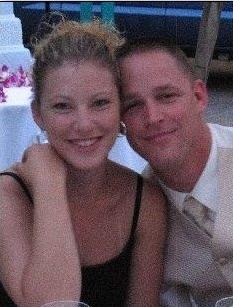 Joseph and his wife, Jennifer, had been married for 4 1/2 years. He was 31. In January, students at Haviland Avenue Elementary School in the Camden County borough of Audubon waved hundreds of tiny American flags and let out a thunderous cheer as Staff Sergeant Joseph Michael Weiglein entered the auditorium to talk to them about life in the Army. For months, the kids had been sending letters and packages to Weiglein, who grew up just two blocks from the school and was visiting them during a 15-day hiatus in his yearlong stint in Iraq. Weiglein answered scores of questions, then showed the kids photos of members of his unit seated beneath the Christmas decorations the students had made for them. "It was thunderous, it was absolutely thunderous," Principal Carleene Slowik said of the ovation. "He promised to come back and apologized that his men couldn't write as often as they wanted." Late Tuesday, the news hit and spread like a flash across the town of 9,000 -- from the house of Weiglein's parents to their neighbors, across the bleachers at the Little League field and down into the dugouts: Weiglein had been killed in Iraq. "Joe was our soldier," Slowik said yesterday. "This made it personal. There's a lot of hugging going on. A lot of sad kids." The Department of Defense said Weiglein, 31, was one of two soldiers killed by a bomb while they were on foot patrol in Ilbu Falris. The other man was identified as Sergeant Richard V. Correa, 25, of Honolulu. 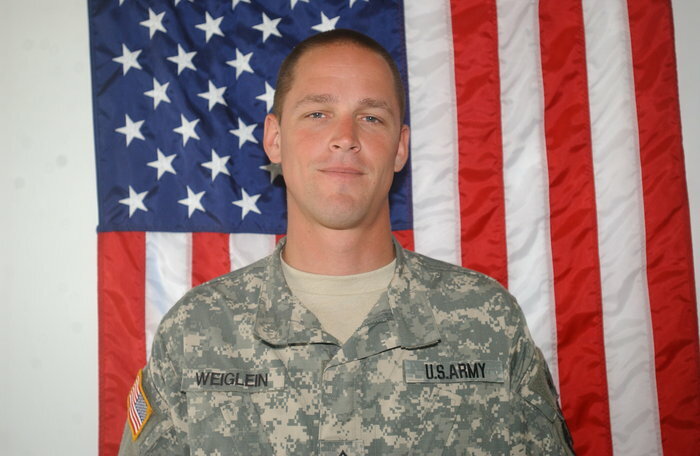 Weiglein is the 74th service member with ties to New Jersey to be killed in Iraq. He was on his second tour. Weiglein lived with his wife, Jennifer, near Fort Drum, New York, where he was assigned to the 10th Mountain Division. Yesterday, the lawn of Weiglein's parents' home, a corner house in the leafy 1.5-square-mile town near Cherry Hill, was festooned with two dozen American flags. "We are all proud of Joey," his sister, Kate Albanese, said as she stood on the front porch. "He believed in what he was doing, so we believed in him." Weiglein was a 1994 graduate of Audubon High School, where he played soccer. District Superintendent Donald Borden, who was a history teacher at the school when Weiglein attended, called him "the boy next door." "Just a great kid," Borden said. "Appropriate, responsible, diligent, always a smile on his face." Weiglein entered the Army the year after graduation, eventually deciding to make it his career. He served one year in Korea, then moved to Fort Riley in Kansas, where he met his future wife. The couple moved to Tennessee, and he spent the next five years there working as a recruiter. When the war in Iraq started, he decided to rejoin the infantry, Albanese said. "He just didn't feel right once the war had started and he was recruiting people and sending them over and wasn't there to fight himself," she said. "He knew that he would definitely be deployed." Albanese said her parents, Michael and Ellen, were too distraught to talk about their son's death. At the elementary school yesterday, faculty members recalled the day in early January when Weiglein wowed students and teachers alike with his presentation and his patience. He answered the kids' questions about guns, about war, about the weather in Iraq and the food the soldiers ate. Several people recalled that one student asked if he was ever scared in Iraq. His only fear, the sergeant replied, was losing one of his men. "Not a thought for himself," Albanese said. "And that sums up the kind of person he was." When it was over, Borden recalled, one of the teachers approached him and told him he should consider becoming a teacher when he left the military. School officials met Wednesday morning to discuss how to break the news to the 600 children in the K-6 school. Many had already heard the night before. But rather than make an announcement, officials decided to send a letter home to parents, delivering the news and alerting them that counselors would be made available at school the next day. "We decided to tell the parents and let them decide how to process it," Borden said. "I'll be 52 in January, and I'm not sure how I'm going to process it." Slowik, the school principal, said of the young students: "I'm not sure what they really understand. They know Joe is dead and he's not coming back. But I don't know if they know the full understanding of it. This is the first time some of the kids have experienced death in a very personal way. And we have a lot of support to offer them." Back on the porch of the home where she and her brother grew up, Albanese said she was taken aback by the outpouring of support from the town. "It's been quite overwhelming, the response," she said. "The friends and family that have been coming, it's been a blessing. It's wonderful to see how many people you can touch in a lifetime -- and it's only 31 years." 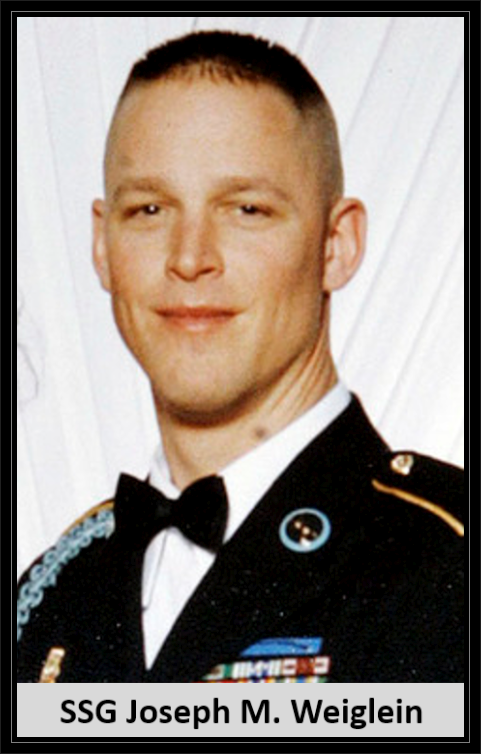 31 May 2007: Schoolchildren lose a friend in IraqAn Audubon school mourns "Joe the Soldier," who died this week in an explosion. Sergeant Joseph M. Weiglein was beloved among the children. He was "Joe the Soldier" for the kids at Haviland Avenue Elementary School in tiny Audubon, New Jersey, a hometown boy fighting for them in far-away Iraq. They eagerly adopted Joe as "their soldier." At Christmas, the school's 250 students packed up boxes of Tastykakes, cards and ornaments and mailed them to his squad of nine soldiers. A big photo of Joe and his men just before they shipped out a year ago hung on the school's office door. And now Staff Sergeant Joseph Michael Weiglein, 31, born and raised and schooled in close-knit Audubon, has died. his mother said he was killed Tuesday in an explosion in a town south of Baghdad. When Joe came home on a 10-day leave in January, he visited the school and answered endless questions at a packed school assembly. Where did he live? What did he eat? Was it scary? The students, who dressed in red, white and blue for him, loved the slides he showed them of the soldiers opening their gifts and cards. They gave him hand-made flags to bring back to the others. "The roar of the crowd when he went into the auditorium that day, you would've sworn a rock star was going in," said Ellen Weiglein, Joe's mother. "They were so joyful to see him." Yesterday, word of his death was just starting to ripple through the halls of Haviland, which goes from preschool to sixth grade. Carleene Slowik, the school's principal, said counselors would be on hand to talk to students, but there was no plan for a schoolwide announcement. "This is a hard one, believe me," Slowik said. Yesterday, she said a fourth-grade student was getting a drink of water from the fountain outside her office. "She said, 'Dr. Slowik, it's so very sad about Joe, isn't it?' "
"Then she said, 'You look sad,' and she came over and hugged me." Michael Weiglein said his middle child had been in the Army for 12 years. He had moved around a lot - South Korea, Kansas, Kuwait, Tennessee and Georgia. His last assignment was as an infantry staff sergeant, based with the 10th Mountain Division at Fort Drum, New York. Michael said that before moving to Fort Drum, his son was working as a recruiter, but he longed to return to the regular infantry. "He was not to be behind a desk," said Ellen Weiglein. "He needed to be up and doing." His parents said he told them that his squad recently went out on patrols, looking for three U.S. soldiers who were abducted earlier this month. "He believed in what he was doing," Ellen Weiglein said. Also surviving are his sisters, Catharine Albanese and Michelle Hubbard. At his old school, the Haviland students plan to honor him once more. Slowik said the school will wait to hear from his wife, Jennifer, of Mexico, New York, to find out her wishes before planning their tribute. "When we adopted Joe and brought him into our Haviland family, in the back of my mind, I thought, 'What if something happens? What am I going to say?' "
"We know Joe had a hard job to do," Slowik added. "We saw where he was and he was protecting us. "And this is part of it."